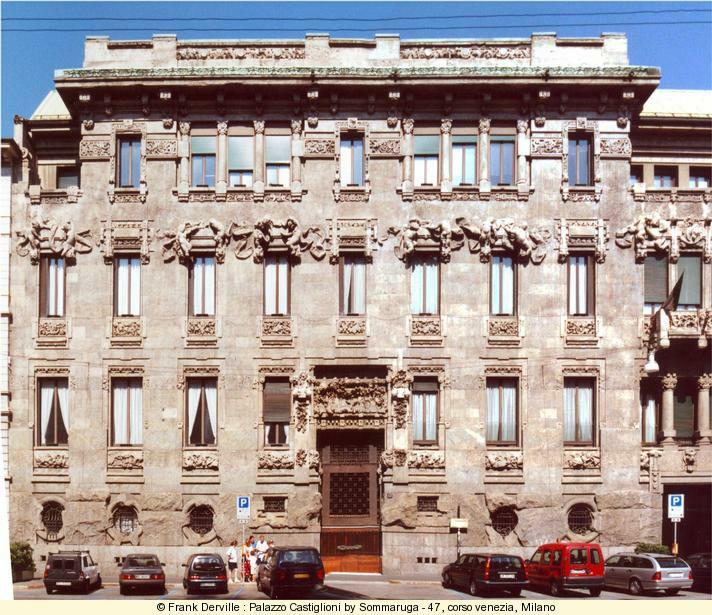 Milano is one of the largest city of Italy and its most important economical center. 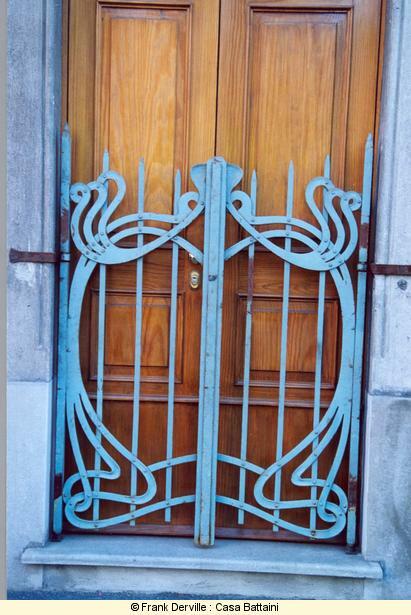 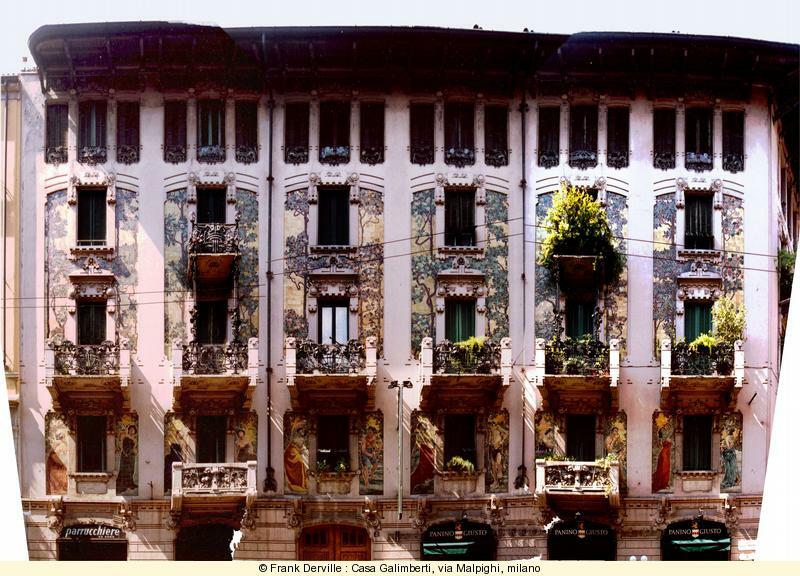 In the years 1900, Milanese industry leaders had their week end near lake Como or lake Maggiore which explains also the use of Art Nouveau in towns like Verbania, Stresa or Bellagio or the Campo dei Fiori near Varese. 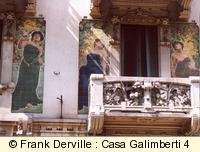 There are several hundreds of Art Nouveau buildings in Milano. 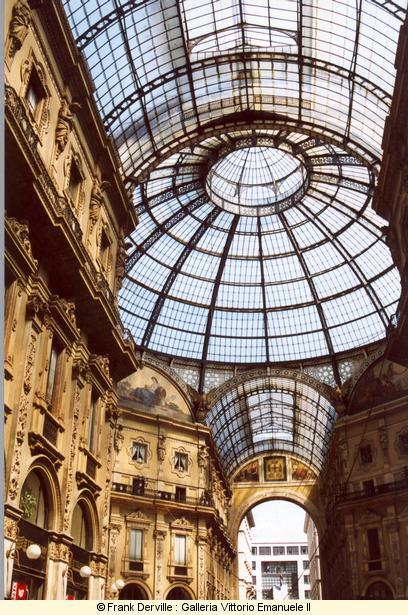 The galleria Vittorio Emanuele II (built in 1865-77 (so it cannot be called Art Nouveau)) is one of the most overwehlming example of the influence of the economical wealth and its industry power. 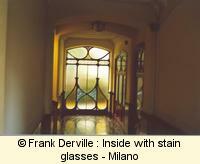 It puts a fine Italian building together with an iron and glass ceiling, creating a really charming place. 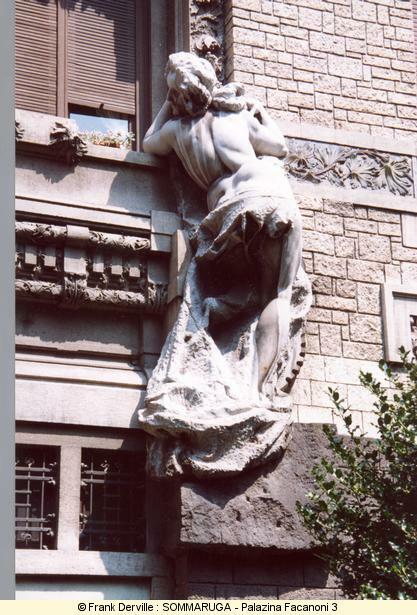 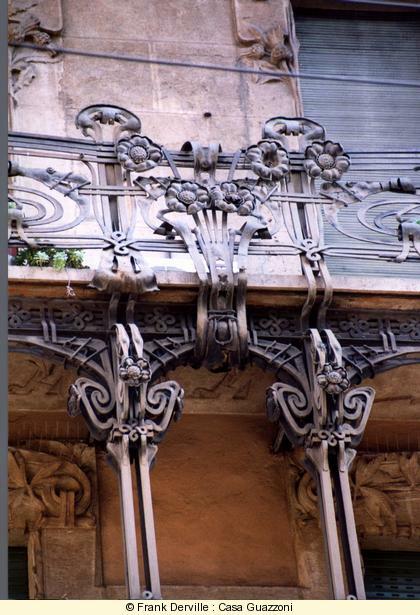 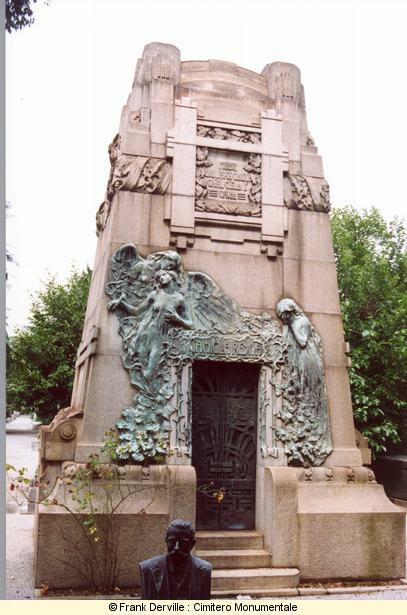 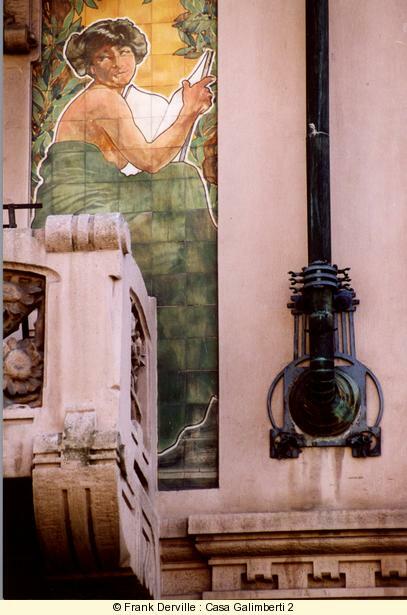 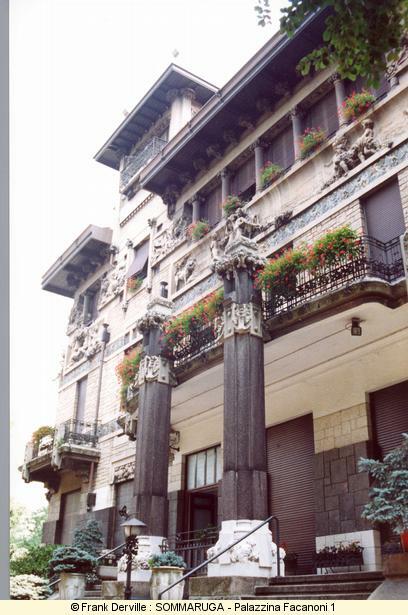 Sommaruga is the most well known Art Nouveau architect of Milano. 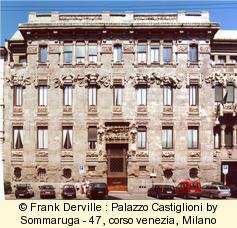 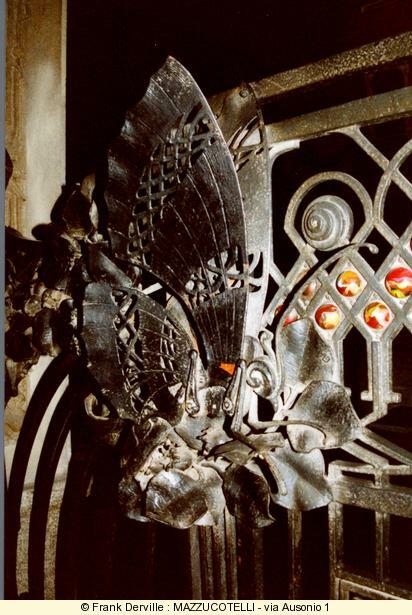 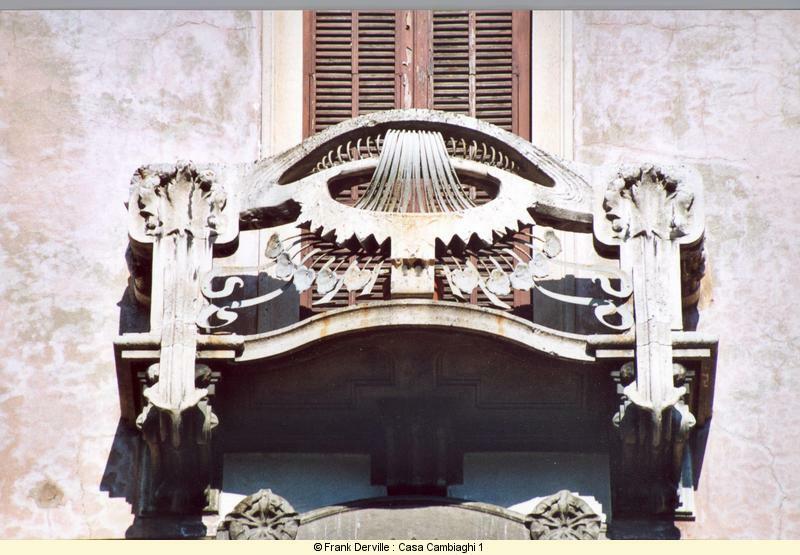 His first important work is the Palazzo Castiglioni in the corso Venezia, 47 built between 1901 and 1904 as a total work of art (see for instance the metal work). 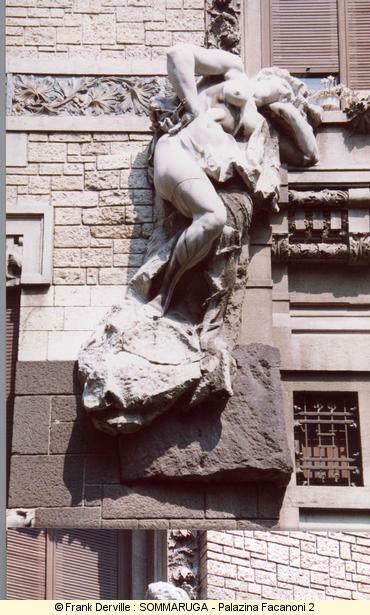 The two statues of the Palazina Facanoni (called Industry and Peace) framed originally the main door of the Castiglioni building. 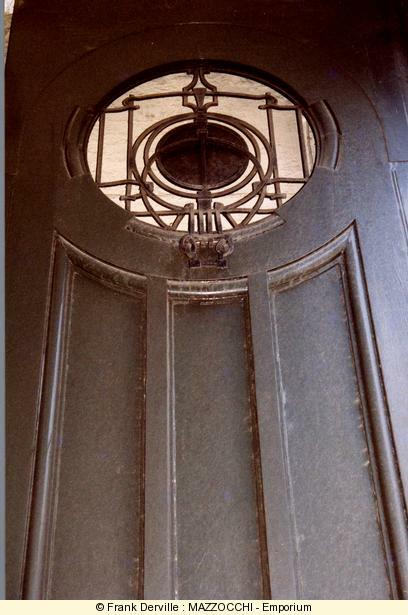 They were removed only 15 days after the inauguration because they made a big scandal. 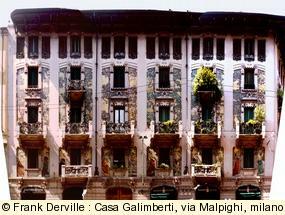 Via Piscane is one of the two main streets of Art Nouveau buildings together with via Malpighi (see below). 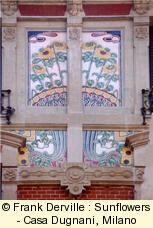 From number 16 to number 22, the whole building block is still built in an Art Nouveau style. 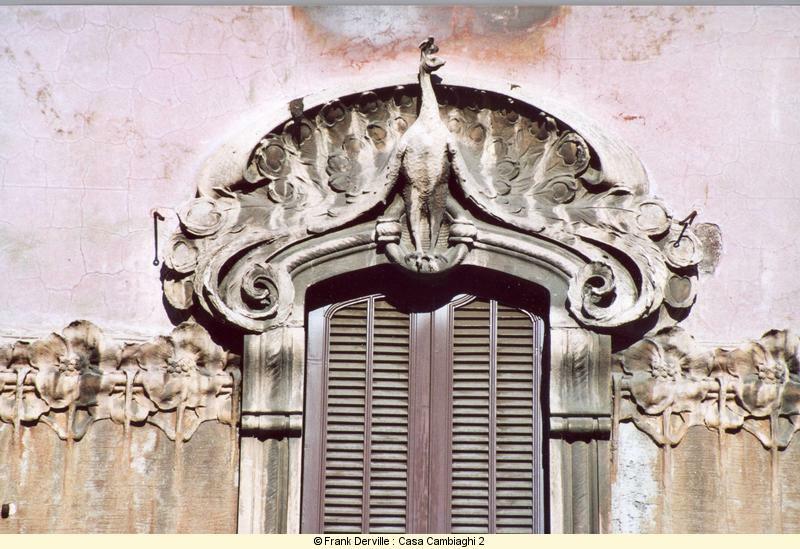 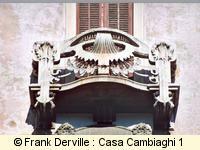 Casa Cambiaghi is one of the block; you can admire the decoration use of the peacock : his back for the balconies and his front over the windows. 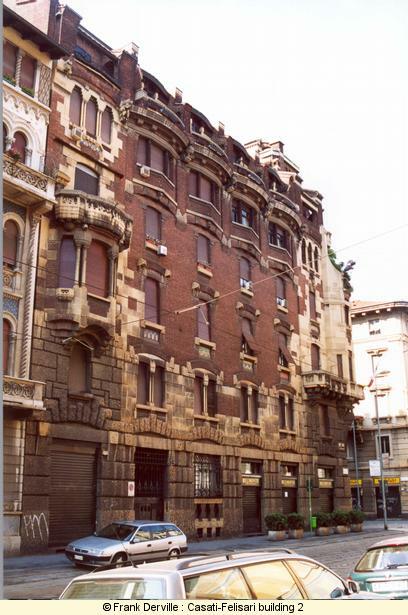 The opposite side of the street had been unfortunatelly destroyed. 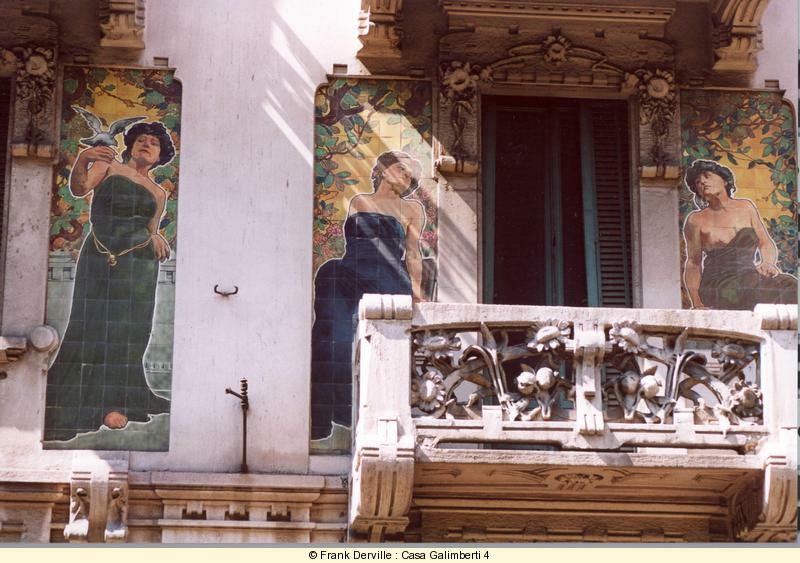 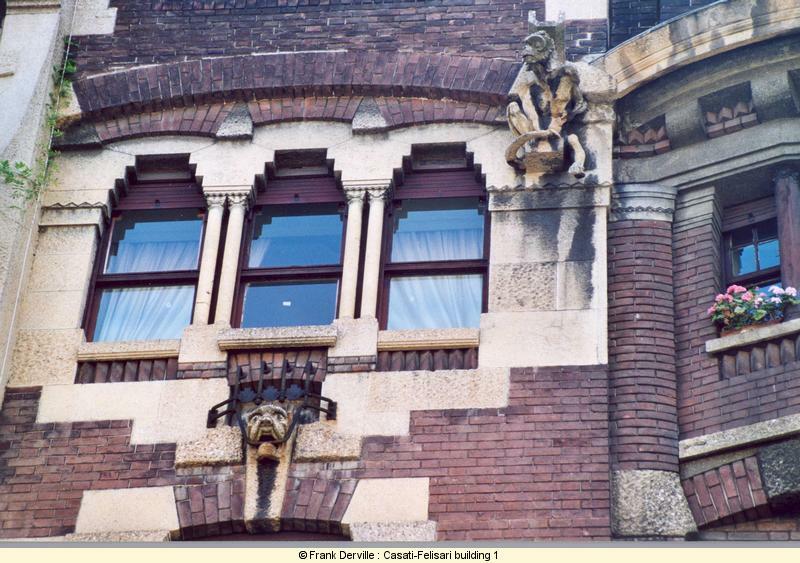 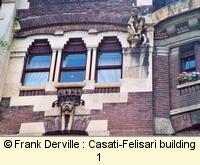 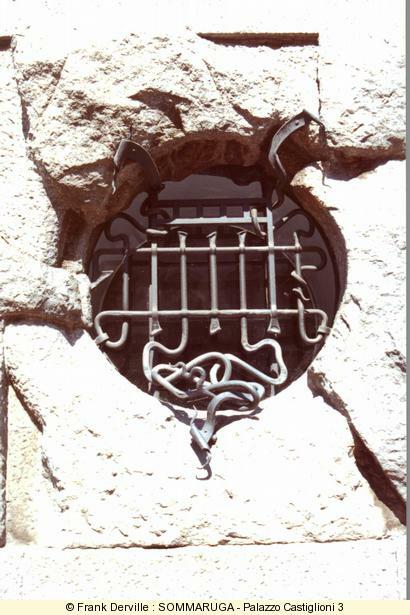 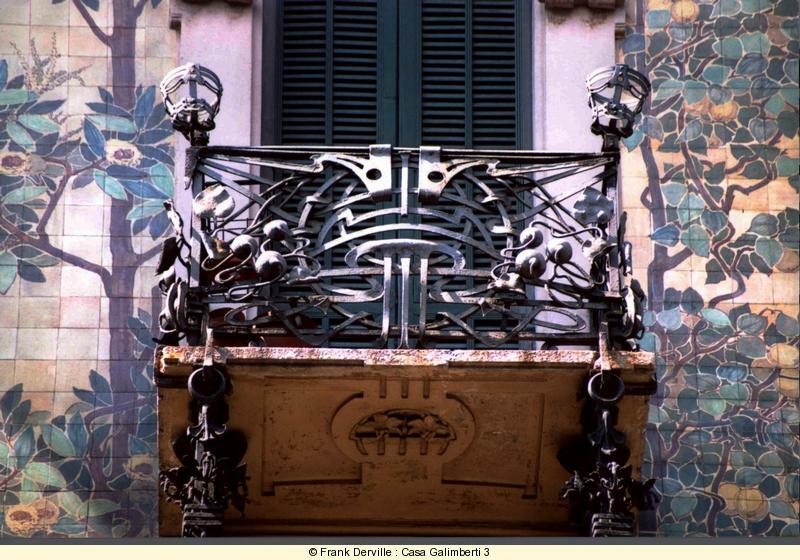 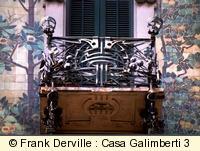 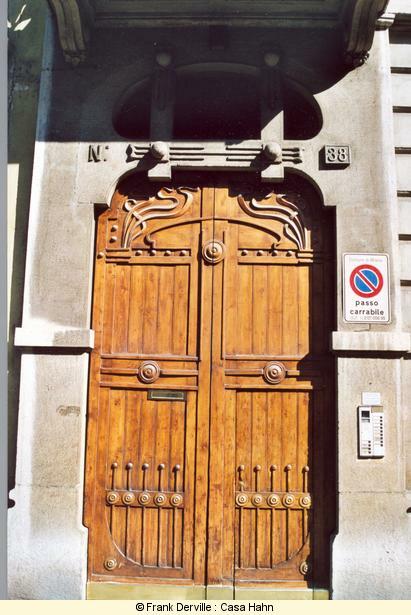 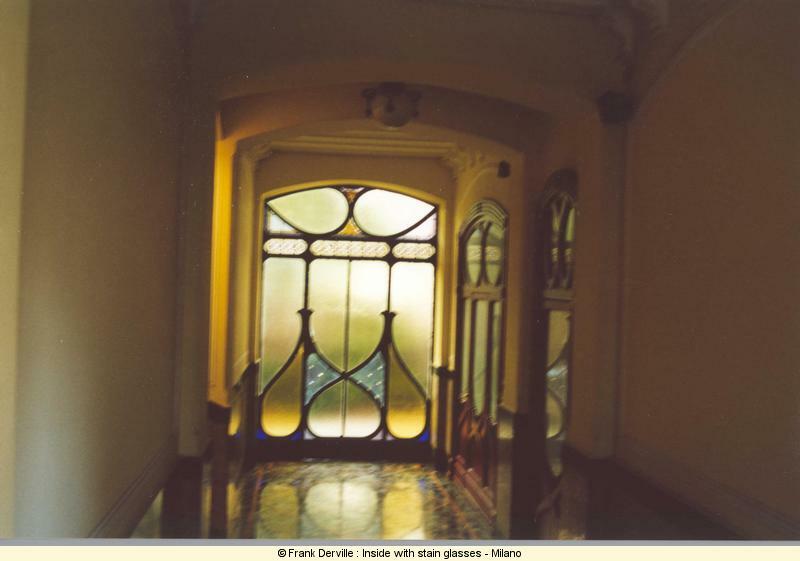 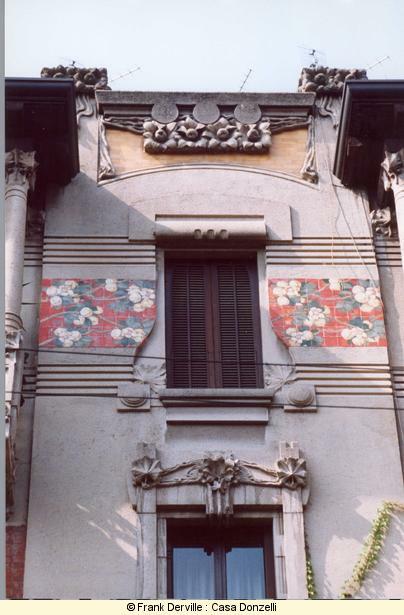 The 41, via piscane (Casa Battaini) was influenced by Belgian Art Nouveau and Horta. 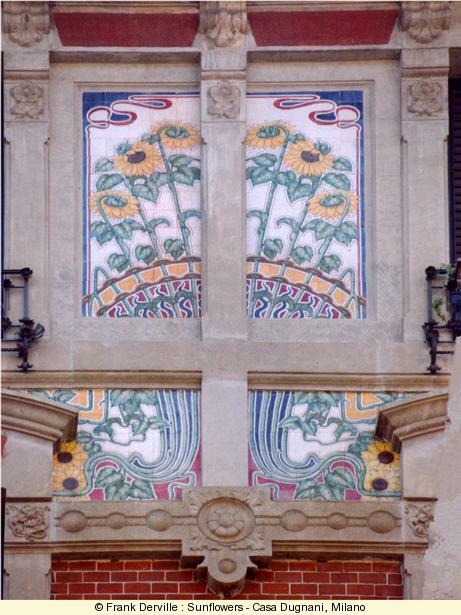 Could this house be called the "Mucha" house? 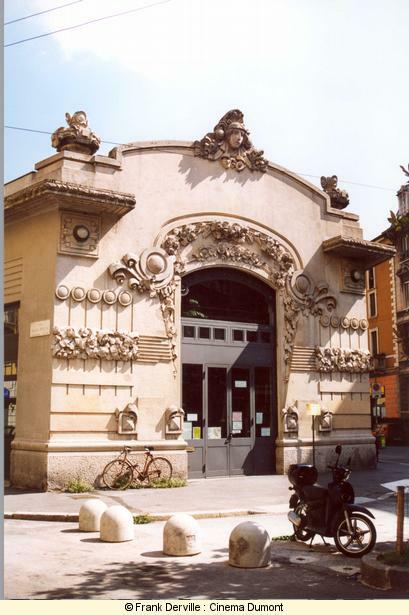 The Cinema Dumont (via Frisi, 8-9 angle with via Malpighi and Melzo) built in 1909. 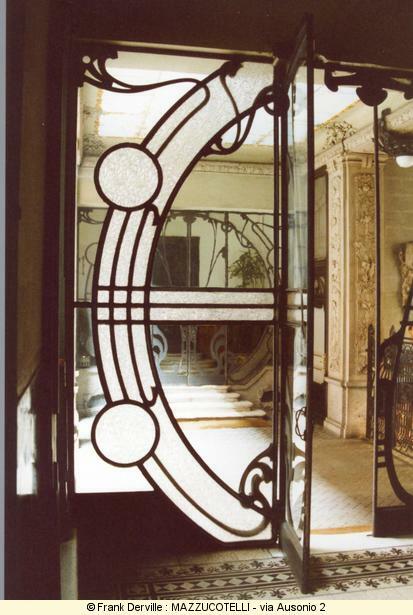 Here are several eamples of door work in Milano : abstract floral wood work and stain glasses for Casa Hahn, more geometrical work for the Emporium (corso Venezia) and a really fine iron and glass work for the building via Ausonio, 2 : note the use of semi transparent glass instead of stain glasses.